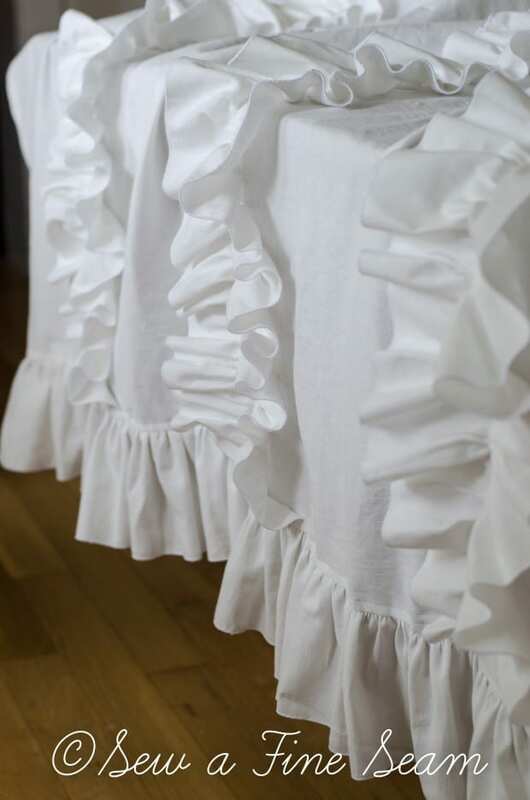 A few weeks ago I made a pair of white ruffled curtains for a client. I bought the fabric at IKEA – have you seen the new fabrics they are carrying? I can hardly hold myself back from rushing straight to the textile section every time I go to IKEA. 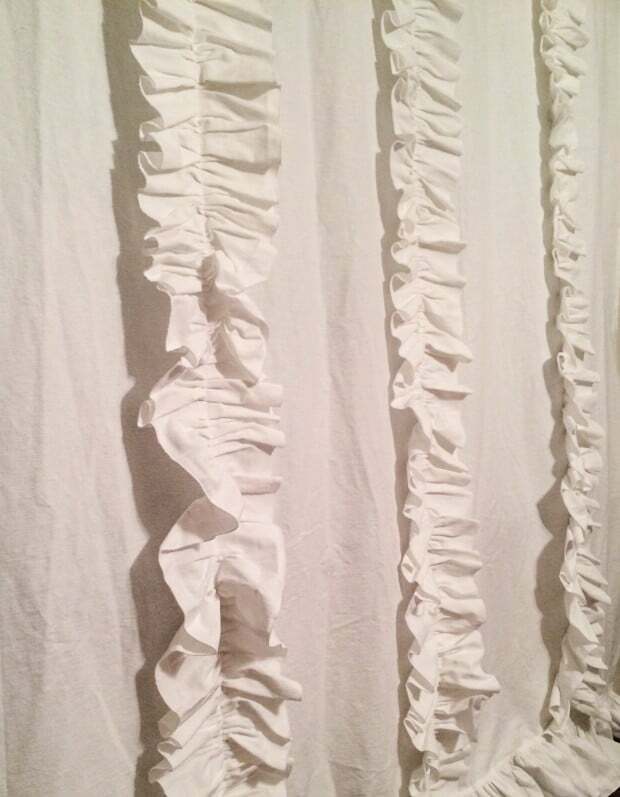 My client sent me a photo of a curtain with ruffles running the length of the panels. I added the ruffle on the bottom because the length didn’t come out quite as long as I had planned. Somehow I misfigured the amount I needed for the casing for the curtain rod. 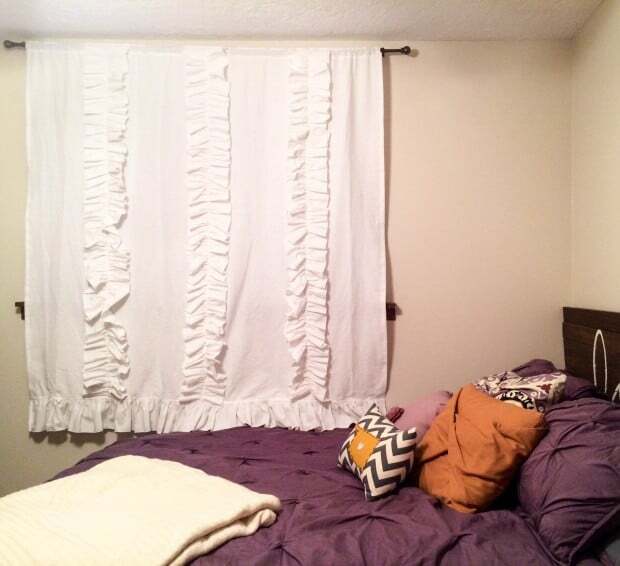 My client sent me some photos of one of the curtains hanging in her bedroom. I think they look great! The fabric is cotton but has a linen look to the weave. 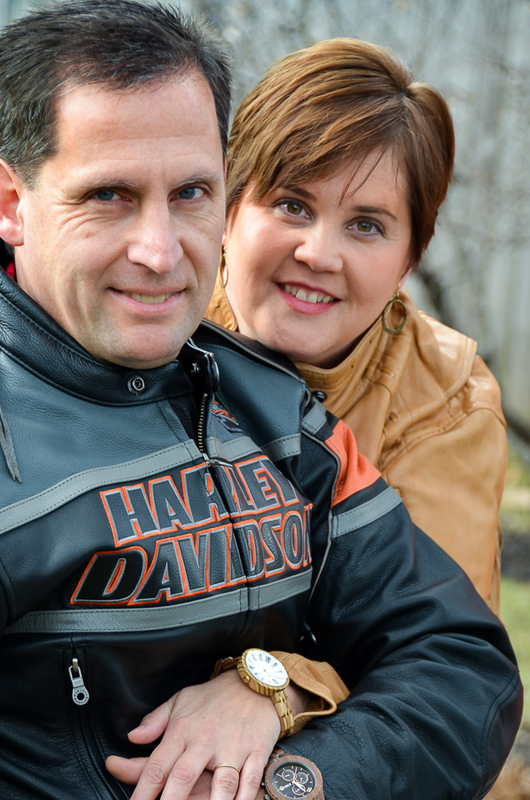 It’s a great weight – not too heavy, not too light. This is the fabric I plan to use to slipcover my wingbacks. I need to get more fabric though. 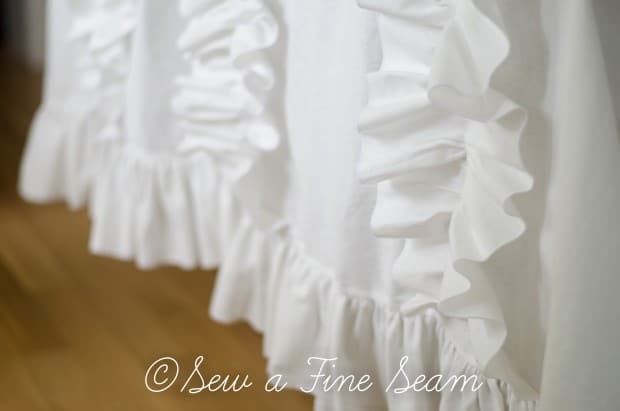 So what’s your opinion – do you like ruffles are you more into plain and simple? Cute curtains! 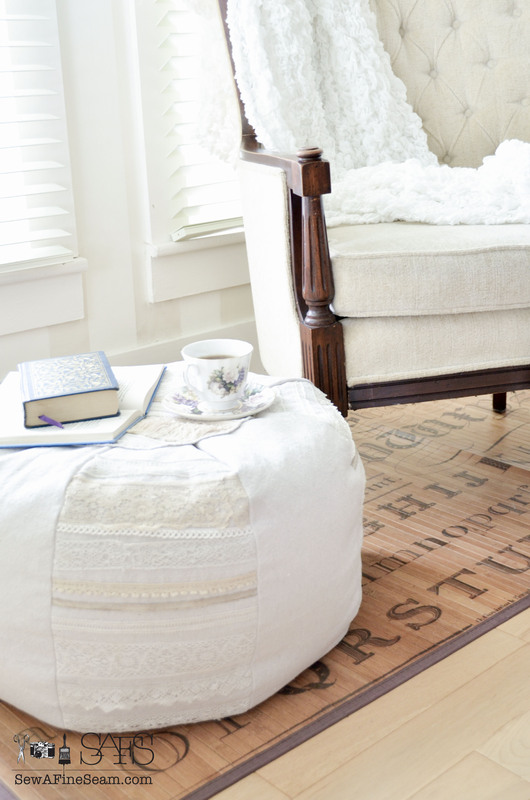 I must admit, I am more into plain and simple – I think it is because I have learned that ruffles are dust catchers!!! Thank heavens curtains can be washed easily. I get a wild hair now and then and seem to think I have to wash every pair hanging in our house, lol. I do put them in dryer often to get dust off and dog hair. The close up photo you showed of curtains shows the fabric you used is quality fabric. Very nice to work with and feel. I think ruffles or no is a very personal choice, goes for wearing ruffles too. Those curtains you made look pretty in that room. I have never had the pleasure of shopping in an IKEA. Have no idea where closest store to us is. Probably better I don’t. Believe it or not in 10 yrs. we’ve lived here have never gone over mountains to shop in Denver where it’s more likely there is an IKEA. My daughter tells me I need to stay away from an IKEA. She knows her Mother much too well. I stay out of many stores like that, no will power. 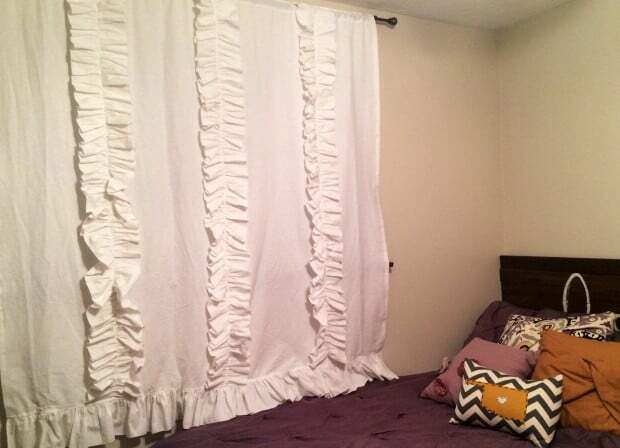 Glad your client loved curtains you made for her. I agree JaneEllen! I love that curtains can just be washed when they start looking sad and tired! Ruffles are certainly a very personal choice. Love how the curtains you made look,really pretty in a bedroom. The fabric you used does look like quality stuff. Can tell from close up of curtains. How lucky you are to have an IKEA handy to visit. I have never been to an IKEA but sure would love to. They came to San Diego well after we left. My daughter tells meI’d go crazy if I got to shop in one so it’s better if I can’t. Thanks a lot. None close around here either. I’m not going to Denver just to visit an IKEA or to Salt Lake. Any trip over mountains at this time of year is very risky with snow possible. Denver had snow last week. Yay! My quandry of what to do for Audrey’s (our vintage trailer we’re ‘doing-up’) curtains is now sorted. 🙂 These are so cute and really very easy to make!